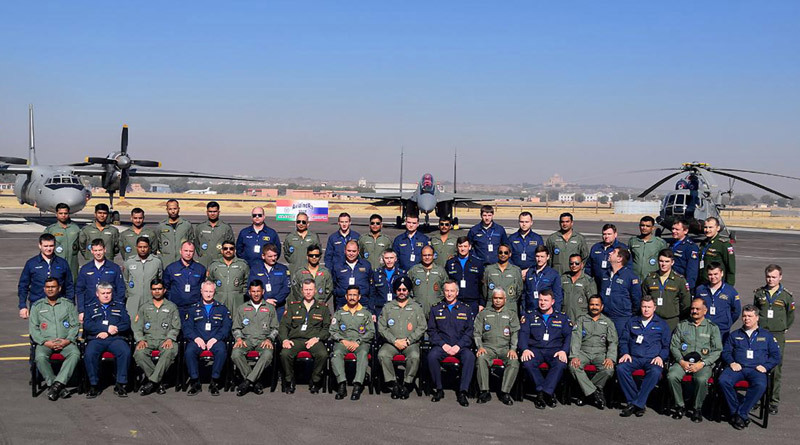 Chief of the Air Staff Air Chief Marshal BS Dhanoa, visited Air Force Station Jodhpur on 19 December 2018 to take stock of the ongoing Ex AVIAINDRA 2018 between Indian Air Force (IAF) and Russian Federation Aerospace Force (RFASF) and interact with the participating forces. The CAS was received by Air Officer Commanding Air Force Station Jodhpur Air Commodore Philip Thomas. The second edition of Ex AVIAINDRA is aimed at exposing RFASF and IAF pilots to single/multi aircraft missions in a counter terrorism scenario within the predefined scope. The 30-member RFASF contingent comprises of fighter, transport and helicopter pilots. The CAS was briefed in detail about various phases of the exercise and was apprised of its progress. Post briefing, he visited the RFASF and IAF detachment, and interacted with the personnel from both the countries. During the interaction, Dhanoa welcomed the RFASF team and emphasised the importance of joint exercises, as they create an environment of camaraderie and provide an opportunity to learn from each other’s best practices. He spoke about the long standing military partnership between RFASF and IAF and the common equipment that both the nations operate. He complimented the efficacy of Russian equipment, as it has played a pivotal role during various IAF air campaigns. Ex AVIAINDRA, a service specific exercise between IAF and RFSAF, is underway at Air Force Station Jodhpur from 10-21 December 2018. The inaugural IAF-RFSAF Ex AVIAINDRA was conducted in 2014. AVIAINDRA-2018 is the second in the series of bilateral joint exercise between IAF-RFSAF. The exercise is a testimony of the Indo-Russian military relationship and would enhance mutual cooperation and understanding between the forces of two countries.